By registering to become a Charli Jane Affiliate you understand and agree to the affiliate terms and agreement below. Our Charli Jane affiliates are very important to us. We do our best to treat you with the fairness and respect you deserve. We simply ask the same consideration of you. We have written the following affiliate agreement with you in mind, as well as to protect Charli Jane Speakers’ good name. So please bear with us as we take you through this legal formality. THIS IS A LEGAL AGREEMENT BETWEEN YOU AND CHARLI JANE SPEAKERS. 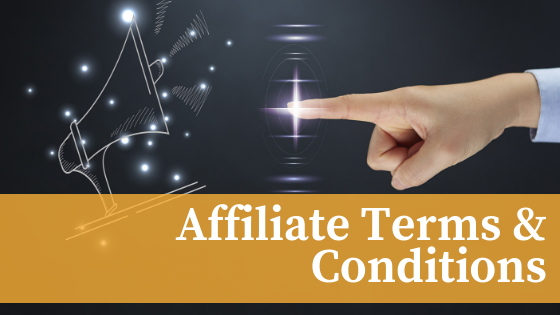 This Agreement contains the complete terms and conditions that apply to you becoming an affiliate in THE CHARLI JANE Affiliate Program. The purpose of this Agreement is to allow HTML linking between your web site and the CharliJane.com web site. Please note that throughout this Agreement, “we,” “us,” and “our” refer to Charli Jane Speakers, and “you,” “your,” and “yours” refer to the affiliate. 2.1.9. You may not create or design your website or any other website that you operate, explicitly or implied in a manner which resembles our website nor design your website in a manner which leads customers to believe you are CharliJane.com or any other affiliated business. 2.2. As a member of Charli Jane Speaker’s Affiliate Program, you will have access to Affiliate Account Dashboard. Here you will be able to access the links to share for our program, products or club. In order for us to accurately keep track of all guest visits from your site to ours, you must use the HTML code that we provide for each banner, text link, or other affiliate link we provide you with. 2.3. CharliJane.com reserves the right, at any time, to review your placement and approve the use of Your Links and require that you change the placement or use to comply with the guidelines provided to you. 2.5. It is entirely your responsibility to follow all applicable intellectual property and other laws that pertain to your site. You must have express permission to use any person’s or entity’s copyrighted material, whether it be a writing, an image, or any other copyrightable work. We will not be responsible (and you will be solely responsible) if you use another person’s or entity’s copyrighted material or other intellectual property in violation of the law or any third party rights. 3.1. We have the right to monitor your site at any time to determine if you are following the terms and conditions of this Agreement. We may notify you of any changes to your site that we feel should be made, or to make sure that your links to our web site are appropriate and to notify you further of any changes that we feel should be made. If you do not make the changes to your site that we feel are necessary within 72-hours of notice, we reserve the right to terminate your participation in the Charli Jane Speakers Affiliate Program. 3.2. Charli Jane Speakers reserves the right to terminate this Agreement and your participation in the Charli Jane Speakers Affiliate Program immediately and without notice to you should you commit fraud in your use of the Charli Jane Speakers Affiliate Program or should you abuse this program in any way. If such fraud or abuse is detected, Charli Jane Speakers shall not be liable to you for any commissions for such fraudulent sales. Either you or we may end this Agreement AT ANY TIME, with or without cause, by giving the other party written notice. Written notice can be in the form of mail or email. You can email your termination to the program to CharliJaneSpeakers@gmail.com In addition, this Agreement will terminate immediately upon any breach of this Agreement by you. We may modify any of the terms and conditions in this Agreement at any time at our sole discretion. In such event, you will be notified by email. Modifications may include, but are not limited to, changes in the payment procedures and Charli Jane Speakers Affiliate Program rules. If any modification is unacceptable to you, your only option is to end this Agreement. Your continued participation in the Charli Jane Speakers Affiliate Program following the posting of the change notice or new Agreement on our site will indicate your agreement to the changes. Charli Jane Speakers uses a third party to handle all of the tracking and payment. The third party is the Samcart affiliate network. If there is a commission owed they will be sent every 30 days via the Paypal address you supply when signing up. Please double check your PayPal email is correct. We are not responsible if you sign up using the wrong PayPal email address. You will create a password so that you may enter your Samcart affiliate dashboard interface. From their site you will be able to receive your reports that will describe the calculation of the commissions due to you. 8.1. You are free to promote your own web sites, but naturally any promotion that mentions Charli Jane Speakers could be perceived by the public or the press as a joint effort. You should know that certain forms of advertising are always prohibited by CharliJane.com. For example, advertising commonly referred to as “spamming” is unacceptable to us and could cause damage to our name. Other generally prohibited forms of advertising include the use of unsolicited commercial email (UCE), postings to non-commercial newsgroups and cross-posting to multiple newsgroups at once. In addition, you may not advertise in any way that effectively conceals or misrepresents your identity, your domain name, or your return email address. You may use mailings to customers to promote Charli Jane Speakers so long as the recipient is already a customer or subscriber of your services or web site, and recipients have the option to remove themselves from future mailings. Also, you may post to newsgroups to promote Charli Jane Speakers so long as the news group specifically welcomes commercial messages. At all times, you must clearly represent yourself and your web sites as independent from Charli Jane Speakers. If it comes to our attention that you are spamming, we will consider that cause for immediate termination of this Agreement and your participation in the Charli Jane Speakers Affiliate Program. Any pending balances owed to you will not be paid if your account is terminated due to such unacceptable advertising or solicitation. 8.2. Affiliates that use among other keywords or exclusively bid in their Pay-Per-Click campaigns on keywords such as CharliJane.com, Charli Jane, Charli Jane Speakers, www.CharliJane, www.charlijane.com, and/or any misspellings or similar alterations of these – be it separately or in combination with other keywords – and do not direct the traffic from such campaigns to their own website prior to re-directing it to ours, will be considered trademark violators, and will be banned from Charli Jane Speakers Affiliate Program. We will do everything possible to contact the affiliate prior to the ban. However, we reserve the right to expel any trademark violator from our affiliate program without prior notice, and on the first occurrence of such PPC bidding behavior. 8.3. Affiliates are not prohibited from keying in prospect’s information into the lead form as long as the prospects’ information is real and true, and these are valid leads (i.e. sincerely interested in Charli Jane Speakers service). 8.4. Affiliate shall not transmit any so-called “interstitials,” “Parasiteware™,” “Parasitic Marketing,” “Shopping Assistance Application,” “Toolbar Installations and/or Add-ons,” “Shopping Wallets” or “deceptive pop-ups and/or pop-unders” to consumers from the time the consumer clicks on a qualifying link until such time as the consumer has fully exited Charli Jane Speakers site (i.e., no page from our site or any CharliJane.com’s content or branding is visible on the end-user’s screen). As used herein a. “Parasiteware™” and “Parasitic Marketing” shall mean an application that (a) through accidental or direct intent causes the overwriting of affiliate and non affiliate commission tracking cookies through any other means than a customer initiated click on a qualifying link on a web page or email; (b) intercepts searches to redirect traffic through an installed software, thereby causing, pop ups, commission tracking cookies to be put in place or other commission tracking cookies to be overwritten where a user would under normal circumstances have arrived at the same destination through the results given by the search (search engines being, but not limited to, Google, MSN, Yahoo, Overture, AltaVista, Hotbot and similar search or directory engines); (c) set commission tracking cookies through loading of Charli Jane site in IFrames, hidden links and automatic pop ups that open CharliJane.com’s site; (d) targets text on web sites, other than those web sites 100% owned by the application owner, for the purpose of contextual marketing; (e) removes, replaces or blocks the visibility of Affiliate banners with any other banners, other than those that are on web sites 100% owned by the owner of the application. CHARLI JANE SPEAKERS MAKES NO EXPRESS OR IMPLIED REPRESENTATIONS OR WARRANTIES REGARDING CHARLI JANE SPEAKERS SERVICE AND WEB SITE OR THE PRODUCTS OR SERVICES PROVIDED THEREIN, ANY IMPLIED WARRANTIES OF CHARLI JANE SPEAKERS ABILITY, FITNESS FOR A PARTICULAR PURPOSE, AND NON-INFRINGEMENT ARE EXPRESSLY DISCLAIMED AND EXCLUDED. IN ADDITION, WE MAKE NO REPRESENTATION THAT THE OPERATION OF OUR SITE WILL BE UNINTERRUPTED OR ERROR FREE, AND WE WILL NOT BE LIABLE FOR THE CONSEQUENCES OF ANY INTERRUPTIONS OR ERRORS. WE WILL NOT BE LIABLE TO YOU WITH RESPECT TO ANY SUBJECT MATTER OF THIS AGREEMENT UNDER ANY CONTRACT, NEGLIGENCE, TORT, STRICT LIABILITY OR OTHER LEGAL OR EQUITABLE THEORY FOR ANY INDIRECT, INCIDENTAL, CONSEQUENTIAL, SPECIAL OR EXEMPLARY DAMAGES (INCLUDING, WITHOUT LIMITATION, LOSS OF REVENUE OR GOODWILL OR ANTICIPATED PROFITS OR LOST BUSINESS), EVEN IF WE HAVE BEEN ADVISED OF THE POSSIBILITY OF SUCH DAMAGES. FURTHER, NOTWITHSTANDING ANYTHING TO THE CONTRARY CONTAINED IN THIS AGREEMENT, IN NO EVENT SHALL CHARLI JANE SPEAKERS CUMULATIVE LIABILITY TO YOU ARISING OUT OF OR RELATED TO THIS AGREEMENT, WHETHER BASED IN CONTRACT, NEGLIGENCE, STRICT LIABILITY, TORT OR OTHER LEGAL OR EQUITABLE THEORY, EXCEED THE TOTAL COMMISSION FEES PAID TO YOU UNDER THIS AGREEMENT. You hereby agree to indemnify and hold harmless CHARLI JANE SPEAKERS, and its subsidiaries and affiliates, and their directors, officers, employees, agents, shareholders, partners, members, and other owners, or contractors, against any and all claims, actions, demands, liabilities, losses, damages, judgments, settlements, costs, and expenses (including reasonable attorneys’ fees) (any or all of the foregoing hereinafter referred to as “Losses”) insofar as such Losses (or actions in respect thereof) arise out of or are based on (i) any claim that our use of the affiliate trademarks infringes on any trademark, trade name, service mark, copyright, license, intellectual property, or other proprietary right of any third party, (ii) any misrepresentation of a representation or warranty or breach of a covenant and agreement made by you herein, or (iii) any claim related to your site, including, without limitation, content therein not attributable to us. 15.1. You agree that you are an independent contractor, and nothing in this Agreement will create any partnership, joint venture, agency, franchise, sales representative, or employment relationship between you and Charli Jane Speakers. You will have no authority to make or accept any offers or representations on our behalf. You will not make any statement, whether on Your Site or any other of Your Site or otherwise, that reasonably would contradict anything in this Section. 15.3. This Agreement shall be governed by and interpreted in accordance with the laws of the State of Nebraska without regard to the conflicts of laws and principles thereof.